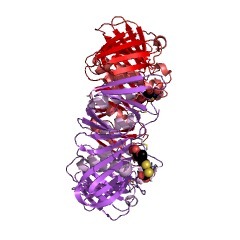 Polbase - Reference: Structure of a small-molecule inhibitor of a DNA polymerase sliding clamp. Structure of a small-molecule inhibitor of a DNA polymerase sliding clamp. 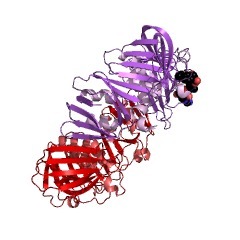 DNA polymerases attach to the DNA sliding clamp through a common overlapping binding site. We identify a small-molecule compound that binds the protein-binding site in the Escherichia coli beta-clamp and differentially affects the activity of DNA polymerases II, III, and IV. 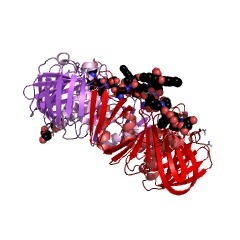 To understand the molecular basis of this discrimination, the cocrystal structure of the chemical inhibitor is solved in complex with beta and is compared with the structures of Pol II, Pol III, and Pol IV peptides bound to beta. The analysis reveals that the small molecule localizes in a region of the clamp to which the DNA polymerases attach in different ways. The results suggest that the small molecule may be useful in the future to probe polymerase function with beta, and that the beta-clamp may represent an antibiotic target.